There was plenty of fresh chaos coming from the Trump administration as The Late Show With Stephen Colbert was taping this evening, what with Donald Trump and Jeff Sessions (both hip-deep in the FBI investigation of alleged collusion between the Trump campaign and noted Trump enthusiasts, Russia) firing one James Comey, head of both the FBI and said investigation. “We’ll have more on this tomorrow when they scramble to cover this whole thing up,” joked Colbert during his monologue, about Tuesday’s unsettling threat to the principles of American democracy and the separation of powers, clearing the way for an hour-long reunion of Colbert’s erstwhile Daily Show co-workers Samantha Bee, Rob Corddry, Ed Helms, John Oliver, and bearded former boss-man Jon Stewart. 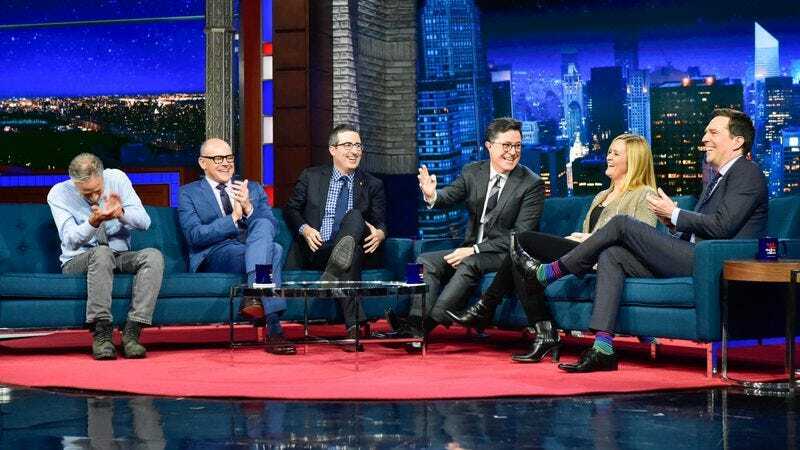 But the vibe of the night was one of old comedy warriors sitting down to swap battle stories, something that only grew warmer as Bee, Corddry, Oliver, and Helms joined the pair for a nostalgic trip through their most harrowing moments as Daily Show correspondents. Showing clips from their first, uniformly and intentionally embarrassing field pieces (Corddry in a leotard in NYC traffic, Oliver bloodily busting his ample honker while ruining a Civil War reenactment), the old gang shared how their function as ironic instigators often led to some very dicey situations. Between Colbert getting menaced by the Klan in Tennessee and Bee finding out that a homophobic Florida politician had plans for himself and a friend to seduce her and her female producer simultaneously, the tales prompted Stewart to joke that the gathering was turning into a Dr. Phil-type intervention, even though he grinningly admitted that he “tried to heighten” their comic plight as much as possible. While joking about Corddry and Helms’ movie careers in hot tubbing and hanging-over, respectively, Colbert pointed out how much influence The Daily Show and Stewart have had on political comedy, with Bee, Oliver, and Colbert all doing variations on the show’s satirical formula on television each week. And while the reunion of comic pundits was definitely more warm than cutting, it was clear that the old friends were drawing some strength for the continuing Trump-era comedy struggles ahead. In the flashback sketch, a frizz-wigged Bee joked about George W. Bush, “there’s never gonna be a president this good for comedy.” Well, here’s hoping that hugging it out tonight gives these comedians the strength to cope with the very mixed blessing of that statement being so, so, catastrophically wrong.